YITH PayPal Adaptive Payments for WooCommerce can be used in combination with YITH WooCommerce Multi Vendor. The integration between the two plugins allows you to automate commission payments towards the vendors in your store. 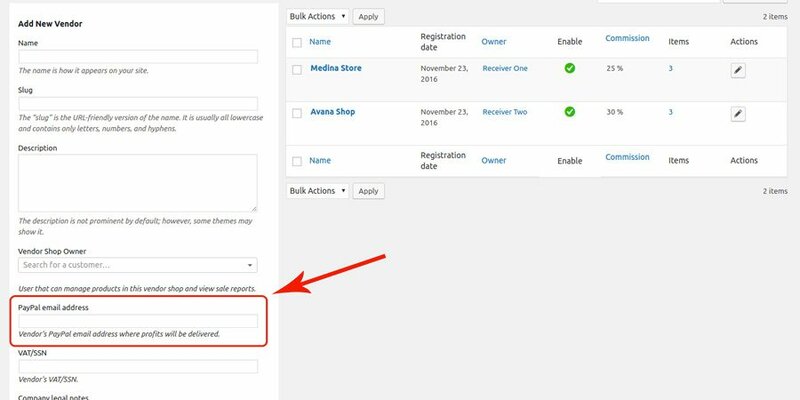 Once you activate YITH WooCommerce Multi Vendor, the “Receiver Settings” tab is removed from the settings panel of YITH PayPal Adaptive Payemnts for WooCommerce settings panel. This happens because managing payments is assigned to YITH WooCommerce Multi Vendor. For a correct us, it is mandatory to associate to each user a valid PayPal address for payments. The plugin will automatically recover the vendor payment address for commissions, from the vendor profile.